As the Silverstone Technology Cluster continues to evolve let’s not forget where it all started – and the report behind it that brought applause from both Government and the business and finance community. Rewind back to summer 2015 and MEPC, 18 months after taking over development of high-tech business estate Silverstone Park, worked with Barclays to commission independent research to find out if the engineering activity and capability in the surrounding region was sufficient to constitute a true ‘industry cluster’. The research returned an emphatic ‘yes’ and was all the more credible as it had been carried out by SQW – the highly respected economic and social development research specialist whose findings first brought the ‘Cambridge Phenomenon’ (Cambridge, UK) to public attention. 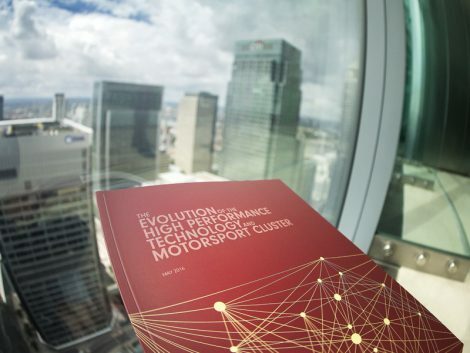 Ultimately the research – charting the region’s high-tech history to in-depth case studies on 20 engineering companies within it – was compiled into a 96-page report titled The Evolution of the High Performance Technology & Motorsport Cluster and published in May 2016. Come July of that year it was presented to an audience of senior industry figures and business and finance community leaders at Barclays’ Canary Wharf HQ in London.